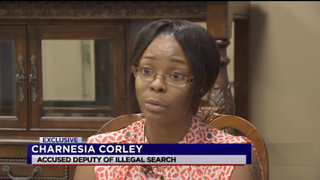 In June, Houston woman Charnesia Corley was pulled over for allegedly running a stop sign. The Harris County sheriff who pulled Corley over said that he smelled marijuana, handcuffed her and searched her car. When he found nothing, he called a female officer to perform a vaginal search on Corley. Corley was subsequently arrested for resisting arrest and drug possession. The resisting charge stemmed from Corley’s refusal to consent to the vaginal search. “I feel like they sexually assaulted me! I really do. I feel disgusted, downgraded, humiliated,” Corley said in an interview with Houston’s KTRK. Corley and her attorney filed a complaint with the Harris County Sheriff’s Office claiming that the search was unconstitutional. On Friday, the Associated Press reported that both of the charges against Corley had been dropped. Prosecutors did not return a request for a comment. Though it certainly won’t mitigate Corley’s assault, I look forward to the massive lawsuit she’ll likely win against the Harris County Sheriff’s Office.